DOMINICAL, SOUTH PACIFIC, COSTA RICA! A FIVE BEDROOM HOME IN DOMINICAL, SOUTH PACIFIC, COSTA RICA. Casa Big Sur is a newly built tropical Tommy Bahama style estate, a one of a kind design that elegantly blends Caribbean influences with modern architecture. Exposed beams, high rise ceilings, quality timber finishes, freshly decorated interiors The property has a total land size of 8112.01 sqm/ 2 acres and a total living space of 628sqm/6800 sqft. and air conditioning throughout. On the main floor the principal entrance to the property leads you into the main open living area including the dining room, living room and kitchen. A large balcony with ocean view, a key feature of the main floor, can be accessed from the main living area. The kitchen design is modern, spacious and practical with granite worktop, solid wood and chrome finishes as well as cooktop island and breakfast bar. A pantry and laundry room is positioned in close proximity to the kitchen. A well designed layout ensures that all bedrooms benefit from ocean views. On the main floor, the master bedrooms feature solid wood flooring, high –rise ceilings and exposed beams with their own private balconies and generously sized en-suites. A Walk-in shower and hot tub are installed in both en-suites have high quality ceramic finishes. An additional room on the main floor has a multi-functional use, of which an office area or additional guest bedroom would be most suitable. On the lower level floor and open plan living area with wet bar offers fantastic views of the infinity swimming pool and pacific ocean. A bathroom and storage room can be found just off this living area. An additional bedroom on the lower level floor can potentially be used as a family movie room considering its location next to the open games room and gym area. The Casa la Big Sur is surrounded by lush landscaping and tropical greenery has a generously sized infinity pool and heated spa situated in front of an open plan living area with wet bar. Additionally an open plan games room and gym with ocean views are positioned in this outdoor area. An expansive patio area with pool deck, outdoor shower and bathroom facilities complete this property’s beautiful yet functional design. A free standing three vehicle garage and workshop are located at the main entrance to the property. This home is located in the town of Escaleras, on the coastal paradise of Dominical looking out onto the Southern Pacific. With its rich biodiversity, breathtaking landscapes and pristine beaches Dominical is a beautifully preserved area of Costa Rica that boasts some of the best coastlines in the world and continues to retain its natural appeal and authenticity. 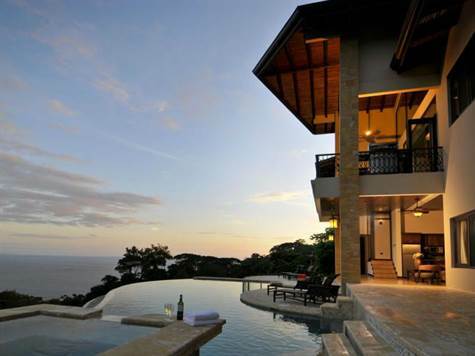 MARKET OVERVIEW The Costa Rican luxury Real Estate market has continued to perform well despite the worldwide economic crisis.